Blue Water Beach Club is letting guests know about sea turtle nesting season, asking them to bring beach chairs off the beach at night. FORT COLLINS – The Colorado State University hurricane research team has issued its first prediction for the 2019 tropical storm season and it is good news, for now The forecast, authored by Dr. Phillip Klotzbach, predicts a total of 13 named storms turning into five hurricanes and two major (Category 3 or more) hurricanes. Last season, the region experienced 15 named storms, eight hurricanes and two major hurricanes. One of those major storms, Michael, was one of the most powerful hurricanes ever to hit the United States. It leveled buildings in Mexico Beach, Fla., and throughout the Florida Panhandle, with winds just shy of Category 5 strength.. On average, the Atlantic and Caribbean region gets 12 named storms, six hurricanes and three major hurricanes. According to Klotzbach’s report, “During the past several months, El Niño conditions have developed in the Pacific Ocean, meaning that sea surface temperatures in the eastern tropics are warmer than normal. In general, El Niño conditions tend to suppress Atlantic hurricane formation, as a result of increases in upper-level winds that tear apart developing Atlantic hurricanes. “Predicting changes in El Niño is extremely difficult during the spring season, so although we know there’s an El Niño now, we don’t know whether it will continue through the rest of the year,” the report says. “Very small changes in wind conditions can cause big changes in the ocean circulation at this time of year. Consequently, the models that forecast El Niño tend to have less skill, which is the measure of the accuracy of the prediction versus what really happens. Nevertheless, these models do have modest ability to predict conditions for the next several months.” The CSU team will release updates to their predictions on June 4, July 2 and Aug. 6.
turtles can start showing up any time now, Fox said. 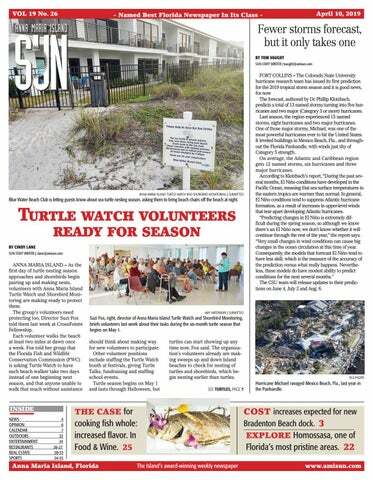 The organization’s volunteers already are making sweeps up and down Island beaches to check for nesting of turtles and shorebirds, which begin nesting earlier than turtles. Hurricane Michael ravaged Mexico Beach, Fla., last year in the Panhandle. Increased costs anticipated for Bradenton Beach dock project A special CRA meeting was scheduled for Wednesday April 10 for continued discussion on the unanticipated cost increases. What remained of the previous storm-damaged and shortened floating dock was removed in August 2017. back a second opinion from Duncan Seawall, Dock & Boat Lift regarding Hecker’s cost estimates. In 2015-16, Duncan built the Bridge Street Pier; the floating dock will be installed next to the pier. The original $119,980 contract the CRA and Technomarine agreed to in early 2017 included $27,000 for dock installation, pilings included. Earlier this year, the CRA released Technomarine of its remaining contractual obligations due to the lengthy delays incurred. “Donate Life Month” on Anna Maria Island The cities of Bradenton Beach and Holmes Beach have proclaimed April 2019 as “Donate Life Month” in those respective cities. On March 21, Bradenton Beach Mayor John Chappie was joined at the podium by Donate Life Florida representative and local Realtor Rita Smith. Chappie read aloud a printed proclamation that said, “One of the most meaningful gifts that a human being can bestow up another is the gift of life.” According to the proclamation, more than 35,000 Americans receive lifesaving organ transplants each year. More than 113,000 men, women and children (including 5,700 in west and southwest Florida) are currently on the national waiting list for organ transplants, and an average of 22 people die each day awaiting an organ transplant. The proclamation notes one donor can save or enhance the lives of as many as 75 people. “Everyone is a potential organ, eye and tissue donor and can register to save lives through organ and tissue donation at www.DonateLifeFlorida or on their driver license,” the proclamation says. “Thank you so much, it’s a wonderful thing you do; and I know someone right now that’s on a waiting list,” Chappie told Smith. A similar proclamation was recently read in Holmes Beach. Mote expands red tide studies Mote Marine Laboratory and Aquarium and Florida Gulf Coast University (FGCU) are partnering for five years to addresses impacts of red tide and other harmful algal blooms to Florida’s environment, economy and quality of life. “Working in partnership, Mote and FGCU will use science to develop innovative technologies to decrease the impacts of red tide and other harmful algal blooms,” Mote President and CEO Dr. Michael P. Crosby said in a press release. “Our joint goal is to not just gain a greater understanding about the ecological forcing functions of red tide and other harmful algal blooms, but to actually do something to decrease the devastating impact of HABs to our environment, our economy and our quality of life.” Mote and FGCU will collaborate on: • Improved understanding of dynamics and forecasting of harmful algal blooms; • Developing effective and ecologicallysound mitigation technologies to decrease the adverse effects of harmful algal blooms; and • Joint appointments of instructional and research faculty for undergraduate and graduate courses, procurement of funding for research, and implementation of cooperative research projects. Visit our website, www.amisun.com. Scan this code with your smartphone to go there. HOLMES BEACH – The quest to hire a city manager in Holmes Beach suffered a significant setback, but the matter has not yet been officially decided. Switching from a strong mayor to a city manager form of government would require a charter amendment recommended by the Holmes Beach Charter Review Commission (CRC) and supported by the city’s registered voters. The Holmes Beach mayor’s responsibilities are set forth in Article IV of the city charter. During the Thursday, April 4 CRC meeting, member Sean Murphy made a motion to leave Article IV as currently written. “There shall be a mayor who shall be the chief executive officer of the city. The mayor shall be responsible to the electorate for the administration of all city affairs placed in his/ her charge by or under this charter,” says Article IV, Sec, 4,01. “I recommend we make no changes to Article IV,” Murphy said when making his motion. David Zaccagnino supported Murphy’s motion. CRC chairman Ed Upshaw and members Claudia Carlson and Nancy Deal opposed it. Confusion then ensued as to what that 3-2 vote meant regarding the potential hiring of a city manager. According to Sec. 13.03 of the city charter, “Any proposed amendment or amendments to the charter adopted by a vote of a super majority of the charter commission shall be presented to the city commission which shall provide for its submission to the voters in the next city general election.” A super majority vote means at least four of the five CRC members must support a proposed charter amendment for it to move forward. The Holmes Beach Charter Review Commission can continue to discuss the city manager question, so the issue is not completely dead. Filling in for City Attorney Patricia Petruff at Thursday’s meeting, attorney Thomas Thanus said, “There may be some confusion about the last vote. There were three no votes and two yes votes, which means the motion didn’t carry. The motion was to not make any changes to Article IV. That motion was defeated, which means that Article IV is still up for discussion. You’ve haven’t closed the door on any further discussion.” The CRC members can continue debating the city manager question, but Thanus said any proposed amendment that doesn’t have super majority support will not be included in the final recommendations presented to city commissioners. “You still have the option of revisiting some or all of your decisions, but you will get to a point where you will have a final vote. At that point, it would take four yes votes in order for something to be presented to the voters at a referendum,” Thanus said. “You’ve had other 3-2 votes, which means you have not achieved the supra majority,” Thanus said regarding previous votes taken on other potential amendments. During Thursday’s meeting, the CRC members voted 5-0 in favor of a proposed charter amendment that would allow the city commission and City Treasurer Lori Hill to amend the city budget using a city commission approved resolution instead of city commission approved ordinance. The CRC recommendation comes with a $100,000 limit. Hill requested the change because a budget amendment via resolution can be easily accomplished at one commission meeting. A budget amendment done by ordinance requires two public hearings, which must be advertised in a newspaper at the city taxpayers’ expense. BRADENTON BEACH – At the request of Sandpiper Resort Co-Op residents, city commissioners are committing up to $50,000 to install a lighted crosswalk at the intersection of Gulf Drive and 27th Street North. Manatee County will reimburse the city for half the crosswalk costs as part of a 2018 interlocal funding agreement that provides each Island city with up to $333,000 in matching surplus beach concession funds for public projects. The commission is also pursuing additional crossing, safety and lighting improvements along Gulf Drive near Katie Pierola Sunset Park and the Gulf Drive Cafe. On Thursday, April 4, the commission unanimously authorized a contract with MSB Services not to exceed $50,000 for the installation of the 27th Street/Gulf Drive crosswalk. The contract includes the original $31,490 MSB Services estimated to install the rapid flashing beacon crossing. At the suggestion of Vice Mayor Jake Spooner, the contract also provides up to $18,510 in additional funds for the possible inclusion of an audio signaling component that would provide the blind and visually impaired with audio confirmation that the pushbutton crossing lights have been activated. The commission previously discussed a lighted crosswalk at the 26th Street North/ Gulf Drive intersection but agreed to move it down one block where an unlighted crosswalk already exists with trolley stops on both sides of Gulf Drive. “It’s makes a lot more sense to have it at 27th Street because of the trolley stops,” Spooner said. “It’s a really busy area. There’s also someone living in the park that has a disability.” Spooner submitted the crosswalk request after Sandpiper resident Doug LeFevre made him aware of the mobile home community’s safety concerns. Spooner said City Engineer Lynn Burnett recently told him it could take up to seven years for the Florida Department of Transportation to install the requested crossing on the state-owned road. Spooner said the new lighted crosswalk will resemble the crosswalk previously installed near the Runaway Bay condominiums. A lighted crosswalk will be installed where this unlighted crosswalk currently exists at the intersection of Gulf Drive and 27th Street North. Spooner asked Deputy Clerk Ruth Stief to read aloud a letter from the Sandpiper residents that was signed by Co-op President Ivan Harper. “We are a senior community located on the east side of Gulf Drive. We have 166 units within the Sandpiper. We have had numerous incidents reported from our residents about close calls or waiting long periods of time to cross the street to either access the beach or catch the trolley going southbound. We have a number of residents over the age of 70 as well as a visually-impaired resident. We are asking for the city to provide a flashing light at the crosswalk to ensure the safety of our residents,” the letter said. Why not stock up now? teries, canned goods and water and spend some real money on a generator, window protection and garage door protection. Make a plan so that the family knows where to go. Also plan to notify friends and family up north on what’s happening. In other words, be prepared. The next update from CSU will come June 4, while the season is in its infancy, and we learn more about El Nino. Let’s hope he's a visitor that sticks around for a long time. Anna Maria Elementary School is unique because of its location on Anna Maria Sound and every year teachers take advantage of that to further educate students about life in an estuary. Third graders took the tour Friday. Thanks to a grant, guides from Around the Bend Nature Tours were there to identify the critters that were netted, put in water filled containers, observed and returned to their habitat. Third grade teacher Karen Paul‘s class brought in some starfish, a tiny seahorse, some whelps and other shells. Many of the kids knew something about the creatures of the sea because of living near the beach both on the Island or the mainland nearby. BRADENTON BEACH 107 GULF DRIVE N.
Beach market, Coquina Beach, 2650 Gulf Drive S., Bradenton Beach, 10 a.m. to 4 p.m. Coloring Club, Island Branch Library, 5701 Marina Drive, Holmes Beach, noon. Ukulele lessons, Island Branch Library, 5701 Marina Drive, Holmes Beach, 3 p.m. Island Time Book Club, Island Branch Library, 5701 Marina Drive, Holmes Beach, 6:30 p.m. The first sea turtle of the 2019 season on Anna Maria Island has arrived! and Wildlife Conservation Commission’s Wildlife Alert hotline at 888-404-FWCC (3922). April 16, 6 p.m. – West Manatee Fire Rescue board meeting, administration office at Palma Sola Presbyterian Church, 6510 Third Ave. W., Bradenton. MARK YOUR CALENDAR NOTE: EVENTS ARE FREE UNLESS INDICATED. flying at you, you’re too close. • Avoid posted bird nesting areas and use designated walkways to the beach. • Keep pets away from bird nesting areas. • Keep the beach clean; food scraps attract predators such as raccoons and crows to the beach, and litter can entangle birds and other wildlife. • If you see people disturbing nesting birds, call the Florida Fish and Wildlife Conservation Commission’s Wildlife Alert hotline at 888-404-FWCC (3922). Veterans services information, Island Branch Library, 5701 Marina Drive, Holmes Beach, 9 a.m. Roser-Robics chair-based exercise class, Roser Church, 512 Pine Ave., Anna Maria, 9:30 a.m. Learn to Download Audio Books, Island Branch Library, 5701 Marina Drive, Holmes Beach, 2 p.m. Jam in the Sand, Anna Maria Island Beach Café, 4000 Gulf Drive, Holmes Beach, 5 to 8 p.m.
Holmes Beach, 5 to 8 p.m. ArtWalk featuring Jerry Patridge, Island Gallery West, 5368 Gulf Drive, Holmes Beach, 5:30-7:30 p.m. ArtWalk featuring Donna Grossman, Artists’ Guild of Anna Maria Island, 5414 Marina Drive, Holmes Beach, 5:30-7:30 p.m. Historic Valentine House open, Robinson Preserve, 1704 99th St. N.W., Bradenton, 8:30 a.m. to 4:30 p.m. Cast net mending, The Folk School at Florida Maritime Museum, 4415 119th St. W., Cortez, 8:30 a.m., $43. Beachin’ Food Truck and Music Festival, Coquina Beach, 2650 Gulf Drive S., Bradenton Beach, 10 a.m. to 8 p.m. Origami Club, Island Branch Library, 5701 Marina Drive, Holmes Beach, 10 a.m. LEGO Club, Island Branch Library, 5701 Marina Drive, Holmes Beach, 2 p.m.
Beach market, Coquina Beach, 2650 Gulf Drive S., Bradenton Beach, 10 a.m. to 4 p.m. Rise and Shine Power Flow Yoga, Robinson Preserve, Mosaic NEST, 1704 99th St. N.W., Bradenton, 10:30 a.m., $10 cash only. Reserve to 941-742-5923 or aedan. stockdale@mymanatee.org. SHOP. STACK. SAVE! Visit BeallsFlorida.com/rewards for full Terms and Conditions. 11:00AM - 2:30PM Hand-selected à la carte brunch menu. Live music. Visit from the bunny. Face painting. Crafts. Games. View the menu at waterlineresort.com/events Complimentary boat docking while dining! need insurance to be on the safe side.” The new maps are subject to a public comment period and subsequent adjustment before they go into effect. Property owners can report anything from incorrect addresses to elevation certificates that differ from the map during the public comment period. The process already has begun, with FEMA representatives and county officials holding two meetings last week to answer questions about the maps. When the comment period ends, local governments will decide whether to adopt the new maps. If they don’t adopt the maps, flood insurance will not available in the community, Vieira said. This 2015 photo shows flooding in Bradenton Beach after a storm. is the 17th year The Sun newspaper has been a sponsor for the Sandbar Easter Egg Hunt. For more information on the Sandbar Easter Egg Hunt and Pine Avenue Easter Egg Roll contact Ashley Chiles at achiles@chilesgroup.com. Don’t miss out! waterfront living from the high $400S If you’re seeking a coastal hideaway with the carefree vibe of Margaritaville, you’ll love the waterfront residences at One Particular Harbour. Outfitted in classic island style, these homes offer beautiful sunset views and owner access to private clubhouse amenities and the new marina. Plus, construction is underway on the new Compass by Margaritaville Hotels & Resorts and Floridays Restaurant & Grill, so you can enjoy even more Margaritaville fun and flavor at your doorstep! Can’t be in paradise all year? Owners at One Particular Harbour can place their residences in a short-term rental program for a vacation home that works on their schedules. Only a limited number of residences are still available for quick closings so act fast! SCHEDULE YOUR TOUR TODAY! All the amenities for a “no worries” vibe: MARINA • beach club • resort-style pool and spa • cabana bar fitness center • kayak launch • sky bar • yoga lawn • and Much more! try the margaritaville lifestyle before you buy! ask about our one particular getaway. (877) 542-0822 | OPHMintoUSA.com | 12340 Manatee Ave. West, Bradenton, FL 34209 The facilities and amenities described and depicted are proposed, but not yet constructed. Photographs are for illustrative purposes only and are merely representative of current development plans. Development plans, amenities, facilities, dimensions, specifications, prices and features depicted by artists’ renderings or otherwise described herein are approximate and subject to change without notice. © Minto Communities, LLC 2019. All rights reserved. Content may not be reproduced, copied, altered, distributed, stored or transferred in any form or by any means without express written permission. One Particular Harbour and the One Particular Harbour logo are trademarks of Margaritaville Enterprises, LLC and are used under license. Minto and the Minto logo are trademarks of Minto Communities, LLC and/or its affiliates. 2019. CGC 1519880. A new vacation rental business is coming to Anna Maria Island. Tampa-based Mainsail Lodging and Development has announced the launch of Mainsail Vacation Rentals. 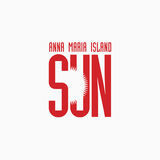 The new company is expected to focus on Anna Maria Island residential vacation rentals. If the name sounds familiar, Mainsail owns the Mainsail Beach Inn and the Waterline Marina Resort and Beach Club in Holmes Beach. Holmes Beach responds to FEMA concerns After a FEMA audit ended with a warning to the city’s building official, city leaders agreed to put an end to permit-to-permit redevelopment of nonFEMA compliant homes. With a five-month moratorium in place, commissioners began discussion about permanent regulations during a March 12 work session. Rather than the three-year cumulative requirement tied to the moratorium, commissioners agreed on a one-year cumulative period. When voting on the final reading of the moratorium March 26, Commissioner Rick Hurst reiterated the need to not exceed a one-year cumulative period. Under the moratorium and regulations being discussed, homeowners who are doing large-scale renovations can apply for building permits for up to 49 percent of their home’s value, but once that 49 percent is reached, they cannot get another permit for a full year. Still under discussion is the start date for the one-year rule, whether it will start when the permit or the certificate of completion is issued. The rule, if it passes commission vote, only applies to non-FEMA compliant homes, ground level structures, and does not apply to necessary repairs due to a storm, fire or other involuntary repairs. homes managed by the new rental service will have a team to manage listings, take reservations, and handle bookings, guest support and maintenance. Shauna Ruby has been hired as the vacation rental company’s general manager. She is joined by Quinn Sabatini, serving as operations manager. For more information on Mainsail Vacation Rentals, visit www. MainsailVR.com. HOLMES BEACH – There have been 19 cases of credit card fraud, most of them in Key Royale, over the past three months and Holmes Beach Police Detective Brian Hall is working to find the perpetrators. So far, the cases have been confined to Holmes Beach and Hall believes the criminals are getting the necessary personal information by stealing mail from the victims’ mailboxes. From that mail the criminals get the victim’s Social Security number and then open a new credit card account. “We think the guilty parties are members of a gang from the Miami area that swoops into an area,” Hall said. Hall made one arrest, a man named Samuel Casamayor Abreu, on March 1 and charged him with four counts of fraudulent use of a credit card. Abreu later was released after posting bond. Hall said installing more security measures, including cameras mounted on the home and doorbells with cameras, would be a smart move for homeowners. In the meantime, he said residents should call the police if they see strangers acting suspiciously around mailboxes in their neighborhood. An aerial photograph shows the docks along the south side of the 85th Street canal. Though the docks are all 25 feet long, the people who own them actually may only own 15 feet of space into the canal. his measurements. He added that he didn’t measure the depth of the water on the north side of the canal or check into the city’s legal obligations in the 85th Street canal. Once he spoke with Petruff, Brisson said he could no longer recommend approval of the dock extension request. BRADENTON BEACH – The Anna Maria Island Chamber of Commerce invites everyone to attend the Fourth Annual Beach’N Food Truck and Music Festival on Saturday, April 13, from 10 a.m. to 8 p.m. at Coquina Beach, south of the trolley turnaround. The festival features an array of vendors selling unique, one-of-akind items including jewelry, local artists' works, clothing, collectible items and more. Bring the kids because there will be a kids’ zone offering fun games, rides, a bungie trampoline and a rock wall for the young ones to climb. Local bands will be performing live music throughout the day and into the evening. Mike Sales will emcee the event as well as entertain with some of his tunes. pavilion by Leffis Key and ride it back up to the North Coquina boat ramp. The shuttle will run from noon to 8 p.m.
leaves at approximately 2:30 p.m. The boat shuttle return rides will be about every half hour beginning at 11 a.m. Boat shuttle tickets are $5 per person and are for a round trip. There will only be a total of 120 tickets sold for the day and tickets will be numbered. Ticket numbers 1 – 45 are guaranteed a seat on the 5 p.m. return shuttle, but riders are welcome to return prior to 5 p.m. Ticket numbers 46 – 75 are guaranteed a seat on the 6 p.m. return shuttle, but riders are welcome to return prior to 4 p.m. Ticket numbers 76 – 120 are guaranteed a seat on the 7 p.m. return shuttle, but riders are welcome to return prior to 4 p.m. For those who elect to stay at the festival later than their return ticket’s guaranteed seat, it is their responsibility to find an alternate method of transportation to return from the festival, such as the free trolley back to Waterline. Additional parking is permitted at Hancock Whitney Bank, 5324 Gulf Drive, Holmes Beach to take the boat shuttle from Waterline Marina Resort & Beach Club. Wild about Harryâ&#x20AC;&#x2122;s The ribbon flies after Harryâ&#x20AC;&#x2122;s Grill owner Mark LaBriola cut it to celebrate the remodeling of the popular eatery last Thursday. The celebration was held in the newly-created outside dining area behind the building at 9903 Gulf Drive in Anna Maria. Chamber guests were treated to a pig roast. chances for survival are slim if it is an escaped pet. If it is used to being fed, it may have trouble feeding itself, and predators like snakes and ospreys are abundant at the park. “It shouldn’t be too hard to find a home for a green iguana,” he said. Once they catch it, that is. If you see a black spiny-tailed iguana or Argentine tegu on the Island, email the photo with date and location to Michael.Elswick@ mymanatee.org. Technomarine never spoke to us about the pilings or anything else to do with the project.” Eric Shaffer, Hecker Construction Company specify which agency or building code now requires more pilings than would have been required when the project was contracted in 2017. On Friday, Gilbert said he’s not aware of any changes to the Florida Building Code that would require more pilings. On Friday, Perry said she was not aware of any new engineering requirements imposed by the Federal Emergency Management Agency or the Florida Department of Environmental Protection. “This issue concerns me,” Perry said. The packet for the April 10 CRA meeting includes two proposed budget amendment requests. If approved, the proposed $45,302 CRA budget amendment would cover the additional cost to complete the dock project using wooden pilings. The proposed $69,456 budget amendment would cover the additional cost to complete the project using composite pilings. commission concurrence to appoint or remove a department head or charter official whose position is listed in the charter. The charter doesn’t reference a developmental services director. Human Resources Analyst Mary Buonagura defended the recent hiring. “Mr. Salmon is the director of five developmental services. He coordinates work, period. He reports to the mayor just like the rest of the departments do. Mr. Salmon is not going to be recommended to become a charter member of the city. It’s not necessary,” Buonagura said. Buonagura said she was told Titsworth consulted with all five commissioners before hiring Salmon. HOLMES BEACH – Easter comes early in the morning to members of the Kiwanis Club of Anna Maria Island on the holy day, Sunday, April 21, for the 55th Annual Sunrise Service held at Manatee Beach, 4000 Gulf Drive. LARGEST SELECTION OF INDOOR & OUTDOOR FANS ANYWHERE! Fellowship and Rev. Douglas Kings of Gloria Dei Lutheran Church will deliver scriptures. Rev. Dr. Bob O’Keefe of Roser Church will deliver the sermon. Matthew Nowicki, Director of Faith Formation of St. Bernard Catholic Church, will deliver the offering prayer. Rev. Stephen King of Harvey Memorial will deliver the benediction. Easter music for singing will be provided. All are welcome to join in. The offertory collection will be divided among the participating churches and the Kiwanis Club of Anna Maria for their SCF Key Club Scholarship program. Bottle boats do battle On Saturday, April 20, the 41st Annual Bottle Boat Regatta brings wet and wild fun to the waters south of the Palma Sola Causeway from 10 a.m. to 2 p.m. The Bottle Boat Regatta is part of the Hernando de Soto Historical Society’s celebration of the area’s history. The boats may be simple, or they may be fancy, but they share two things: buoyancy from empty plastic bottles and propulsion by oars. Teams of kids and adults build them for a sponsor and they share the joy of victory or the agony of defeat trying to keep the rudderless watercraft from going off-course. Hernando de Soto will be there to give the teams his blessing and his court will be there to cheer them on. It’s fun; it’s free and there will be food and liquid refreshments. Don’t forget to bring a beach chair and a cell phone or camera. Crews of all ages compete to come in first but they often get off-course because they don’t have rudders. A NONDENOMINATIONAL, CHRISTIAN CHURCH WHERE EVERYONE IS WELCOME! ANNA MARIA ISLAND – Come out to The Center of Anna Maria Island on Thursday, April 11 to see the hottest new fashions for women, men and kids, and support a good cause. The first-ever Passion for Fashion Show will take center stage beginning at 11 a.m. The event will feature an elegant luncheon by culinary master A.J. Loft of The Loft 5, along with champagne and live steel drum music. Models will strut down the runway wearing the latest in spring and summer styles for women, men and children from Pine Avenue boutiques Bella By The Sea and Pink & Navy. he great American artist Winslow Homer (1836-1910) was enamored with Homosassa. Homer regularly traveled to Florida, the Bahamas and Cuba during the winter months and this wild, spring-fed coast was high on his list of destinations. The name itself is derived from a Seminole Indian name, “river of fishes.” Fortunately, the natural beauty that attracted his artistic talent and the fish that he pursued (another passion) can still be found there. In 1904, Homer painted at least 11 watercolors during a stay. In a letter to his brother Arthur, Homer described Homosassa as, “The best fishing in America as far as I can find.” More recently the area was known as a fly fishing mecca for anglers who found large numbers of trophy tarpon in the late 60s, 70s and 80s. While the tarpon fishing waned in the latter part of the 1900s (it’s on the rebound again) the region runs deep with redfish, trout, cobia, grouper and hundreds of other species. A quick look at a map makes it clear why this region has been and remains such a magnet for gamefish and the anglers that pursue them. Fishing around Anna Maria Island is downright insane right now. It really doesn’t matter what type you want to do, it’s all good. The warm weather is pushing us into spring and the fish know it. We here at Anna Maria Charters have been spreading ourselves thin and covering ground. Inshore, the snook, redfish, trout and Spanish mackerel are pretty easy to find right now. With live Pilchards as the staple bait, you’ll be sure to hook up. Freelining with 20 lb. test is our method for these. The type of hook depends on the species. The offshore fishing has been amazing. Since the full moon has passed and with the water temperatures bringing in big schools of bait, things are on fire. Blackfin tuna are in depths of 60 to 120 feet and are eating cigar minnows and Spanish sardines. Kingfish are in depths from 30 feet out to 100 feet or so. Using light wire and anything shiny will get you hooked up. Red grouper and mangrove snapper are thick on the wrecks and ledges. Dead baits on the bottom will help you fill the cooler. As things progress, I assume the tarpon will be here thick unless another cold snap sets us back a bit. Good luck and tight lines. Stephanie Wallace, of Renton, Wash., shows off a healthy red grouper caught with David White of Anna Maria Charters. shank hook if you are live bait fishing them. I am a huge fan of Spanish mackerel sashimi. Bleed the fish as soon you catch them and directly to ice, fillet and remove all the blood line, slice it thin and serve it with soy sauce and a dab of wasabi. It is delicious. proved elusive the redfish and trout were eager to take a well-placed fly. During the afternoon we encountered large schools of 10-15-pound jack crevalle that viciously attacked our topwater poppers. The fishing was about as good as it gets as school after school of large jacks crisscrossed the flats. Making it even more exciting, the water was crystal clear allowing us to see and get positioned for the jacks well in advance. We had planned to fish a third day but the weather turned rainy and windy with an approaching front. The experience left me eager to return and further explore the region's bounty. The amenities and hospitality of McRae’s provided me with a “home port” for a return trip I’m planning this summer. If you want an experience of the timeless beauty of an area that’s aptly named the Nature Coast, Homosassa should be a top priority! Captain Jimmy Long can be reached at 352422-1303 or check out his website at www. homosassaoutfitters.com. Contact Captain Jim Farrior at 352-422-1992. Book your stay at McRae’s of Homosassa by calling 352-628-2602 and check out their website and their live river cam at http://www.macraesofhomosassa.com. It’s a trip that you’ll remember and will keep you coming back. Marshall Tucker Band rocks The Center The Center of Anna Maria Island hosted the final show of its concert series April 1 as The Marshall Tucker Band took the stage. member Doug Gray, on lead vocals and tambourine, leads a talented group of musicians including B.B. Borden on drums, Tony Black on bass and vocals, Chris Hicks and Rick Willis, both on vocals and guitar, and Marcus James Henderson on keyboards, flute, saxophone and vocals. The Cabana Boys opened for The Marshall Tucker Band. The band played to an energetic, sold-out crowd of around 750 people in an intimate show on The Center's stage. The concert brought to a close the nonprofit's first-ever concert series, presented in conjunction with the Bradenton Area Convention and Visitors Bureau and Manatee County Tourist Development Council, along with The Manatee Performing Arts Center, which provided volunteers and ticket sales for the concert series. Previous acts on the Center's stage included The Outlaws, Phil Vassar and BJ Thomas. Part of the ticket sales from the concert series will go to help fund The Center's programs. outfits and a luncheon will be served. Tickets to the raffle baskets and cash prizes will be sold at the show. This is a major fundraiser for the garden club, which helps support many beautification projects. At the Island Branch Library, 5701 Marina Drive, Holmes Beach: • Wednesday, April 10, Coloring Club, noon to 1 p.m.; Ukulele Lessons, 3 to 4 p.m.; Island Time Book Club: “The Diplomat’s Daughter,” by Karin Tanabe, 6:30 to 7:30 p.m. • Thursday, April 11, a veteran’s services professional will be available to help vets with needs, 9 to 11 a.m.; Learn how to download Audiobooks, 2 to 3 p.m. • Friday, April 12, Forty Carrots Partners in Play, 10 to 11 a.m.; Mahjong Club, 11:30 a.m. to 1:30 p.m.; Alzheimer’s Caregiver Support Group, 2 to 4 p.m. • Saturday, April 13, Origami Club, 10 a.m. to noon; LEGO Club, 2 to 3:30 p.m. • Tuesday, April 16, Preschool story time, 10 to 11 a.m.; Mahjong Club, 11:30 a.m. to 1:30 p.m.; Tech Help, 1 to 4 p.m. For more information, call the library at 942-778-6341. The Marshall Tucker Band plays The Center of Anna Maria Island. In celebration of Florida Gopher Tortoise Day on Wednesday, April 10, everyone is invited to Robinson Preserve’s Mosaic NEST at 10299 Ninth Ave. NW, Bradenton, from 9 a.m. to 4 p.m. to visit Genbu, Manatee County’s gopher tortoise ambassador. Gopher tortoise burrows provide shelter for more than 350 other species, and visitors are invited to crawl through a human-size burrow to learn more about the incredible gopher tortoise. County naturalists will have activities, giveaways, and fun for the whole family. No reservations are required. It’s a Treetots Bug Bonanza from 10 to 11 a.m. on Thursday, April 11, at Robinson Preserve’s Mosaic NEST, 10299 Ninth Ave. NW, Bradenton, Parents, grab the youngest member of the house and join Manatee County Parks and Natural Resources for a buzzing bug-tastic adventure. They will flutter from one bug to another, exploring the different insects hiding in plain sight. This program is suitable for newborns to 2-year-olds. Reservations are required by e-mailing coral.bass@ mymanatee.org or calling 941-742-5757 ext. 4. The Cortez Cultural Center is offering a Monkey Bus tour of the village, a working fish processing plant, and several historic homes on Saturday, April 13 at 10 a.m. Alan Garner, a native of Cortez, will tell the history of Cortez, the houses, and the fishing industry for a $10 donation. Meet at the parking lot of the Florida Maritime Museum, 4415 119th St. W., Cortez. Call Kaye Bell for more information and reservations at 941-538-0945. Artwalk returns this month on Friday, April 12, from 5:30 to 9:30 p.m. Art galleries and outlets in the shopping centers at Gulf Drive and Marina Drive will be open for the public to browse and purchase the works of local artists. The Artists' Guild Gallery at 5414 Marina Drive will feature artist Donna Grossman, the artist of the month. The theme of Grossman’s window for the month of April is “Every Picture Tells a Story.” She will be on hand to share the backstories of these paintings and why they compelled her to put brush and paint to canvas. Grossman recently won third place at the Studio at Gulf and Pine under the theme "The Space Between." Her work will be on display in the window of the Artists' Guild Gallery for an artist's reception that night that will include beverages and hors d'oeuvres, starting at 5:30 p.m. For more on Grossman, visit https://www. donnagrossman.com/. Preparing bone-in fish pays off in better flavor. example, the chicken breast typically does not move as much as the leg of a chicken. Thus, the chicken leg is the “dark” meat. Same goes for fish. Fish that have “forked” tails are usually fast swimmers. They produce a more prominent “fishy” flavor. Fish that have “flat” tails can be compared to the average “couch potato” in turn resulting in a more succulent softer fillet. All in all, do not let whole fish intimidate you. Remember fish have a simple two-dimensional bone structure. Much simpler than chicken. Three simple cuts and you are in your glory. First, make a vertical cut from the top of the head towards the belly. The second cut is a short stroke through the body of the fish down to the tail. The third cut is the one that goes right on the top ridge of the fish that connects the first two cuts. Now take a blunt edge knife and lift the fillet off! In order to get to the bottom fillet simply grab the tail of the fish and pull up. The bones will easily pull out of the fish and now you have a boneless fish fillet. For the future, if you find a bone in your fish…use it as a tooth pick and don’t send that beautiful piece of fish back. “Bone” appetit! towels. Use a sharp knife to lightly score the top of the fish in diagonal lines about 1 inch apart. 3. Brush the fish generously on both sides with the oil. Then briefly brush the inner cavity with oil as well. 4. Slice half of the lemon into slices, and stuff those as well as the garlic and herbs into the cavity of the fish. 5. Season the outside of the fish generously with a few good pinches of sea salt, black pepper. 6. Roast for 18-20 minutes, or until the fish reaches an internal temperature of 145°F and flakes easily (cooking time will vary depending on the size of your fish.) 7. Remove from the oven, and squeeze the juice from the remaining lemon half evenly over the top of the fish. Season once more with flake sea salt. Serve immediately. Holmes Beach. She said that while Nazarro was a Holmes Beach resident, his 84th Street home was sold in February. She recommended the commissioners develop a common policy for how to deal with future requests for the owners of the docks. There will be an astronomical extravaganza in the Robinson Preserve Expansion on Saturday, April 13, from 8 to 10 p.m. Dozens of local astronomers will be set up in the Robinson Preserve Expansion, 1704 99th St. NW, Bradenton, with telescopes at the ready. It’s an opportunity to view the skies through high-powered telescopes. Learn how to identify these heavenly bodies, and how you can stargaze at home too. This program is in partnership with The Local Group of Deep Sky Observers. No reservations are required. For more information, email aedan.stockdale@ mymanatee.org. 9 a.m. to noon along the Palma Sola Causeway. Do your part to protect our species by spending your morning on the water and helping clean up marine debris along the southern shores of Robinson Preserve. They will be launching from the northwest side of the Palma Sola Causeway. This program is suitable for ages 16 and older who can meet the county's minimum eligibility requirements. For individuals that do not own boats, 10 kayaks and gear are available from our WCINDfunded fleet on a first-come, first-served basis. All participants must wear a life jacket. Reservations are required by emailing sarah.denison@mymanatee. org or calling 941-742-5923 ext. 6044. Bring binoculars and bird books to Leffis Key, south of Bradenton Beach on the bayside on Tuesday, April 16, from 8:30 to 10:30 a.m. An Audubon guide will lead participants on a tour through Leffis Key’s coastal habitats. Check out the “locals” as well as the migratory birds that are wintering here. This program is sponsored by the Manatee County Audubon Society. Reservations are required. Email kathydoddridge56@gmail.com to register. The Folk School at Florida Maritime Museum, 4415 119th St. W., Cortez, has classes available in April to educate people on the way people lived in the Cortez fishing village. The first is a tour of the A.P. Bell Co. Fish House on Thursday, April 18. It starts at the Florida Maritime Museum first, for a tour with staff of the museum and to learn about Cortez history, followed by a walking tour through the village to A.P. Bell where you will be guided by owner and fourth-generation Cortezian Karen Bell for a behind-thescenes tour of the fish house. For more information or to sign up call 941-708-6120.
for $95 and heart scan-echocardiogram for $95 or all six tests for $179. Blood tests, liver, cholesterol, PSA and TSH tests are also available. To register, call 1-888-667-7587. Castles in the Sand LOUISE BOLGER Manatee increased by 11.1 percent. These are great numbers especially when you look at them compared to last year’s sales number as reported by the National Association of Realtors. Nationally, last year was the weakest for home sales since 2015 with buyers pulling back because of rising mortgage interest rates, a shortage of starter homes and a volatile stock market. However, the February home sales of previously owned homes nationally were up 11.8 percent, the largest monthly gain since 2015, obviously due to the lowering of mortgage interest down to 4.28 percent in March from 5 percent at the end of last year. time that really tells the story, and the year over year story for Manatee and Sarasota Counties is spectacular. The months of March and April traditionally experience the most closed sales, so I look forward to when those numbers are compiled before we head into our slower summer season. That said I may have to revise that statement down the road since there doesn’t ever seem to be a slow season any more. It goes without saying that Florida’s Gulf Coast is one of the most beautiful areas in the country. We have beaches, sun, culture, low taxes and great choices when it comes to purchasing a home. And what comes along with all that is more people, more cars and overbooked restaurants, even Sarasota Airport is reporting a 35 percent increase in traffic during February this year, but would you change anything? It just might take a little better planning. OBITUARIES George R. Ibasfalean George R. Ibasfalean, 89, of Bradenton, died March 29, 2019. Born in Monroe, MI he moved to Bradenton in the 1950s and he was a devoted Bible student. He was a member of many Bible study groups and he died anticipating the return of our Lord and Savior, Jesus Christ. He is survived by his sons, Bryan (Jo) and Mark (Kim); his brother, Glen; his sisters, Mary and Edna; his four grandchildren and 1 great grandchild. There will be no local Services at this time. Brown & Sons Funeral Homes & Crematory 26th Street Chapel is in charge of arrangements. Condolences may be made to www. brownandsonsfuneral.com. Degree from Assumption College. Rose leaves as her legacy, her daughter, Karen Cavaca and her husband, Daryl Cavaca; her son, Burton Comfort and his fiance, Prida Wojtowicz. She also leaves her grandchildren, Bianca Bratkon of Delray Beach, FL, Alexandra ComfortWasnewsky and her husband, Cory Wasnweksy of Nashville, TN, Nicholas Bratkon of Boston, MA, Samuel Comfort of Providence, RI and Katie Cavaca of Dedham, MA. She was preceded in death by her brother, Paul Henick. Rose was a psychotherapist until she retired, and continued her quest for social justice, volunteering as a Guardian Ad Litem. Rose also volunteered at many theaters in the Bradenton, Sarasota area and was a member of Friendship Knot, Manatee Patchworkers, Sarasota and Modern Quilt Guilds. Rose was very active in her condo association, including serving as president. She had a passion for travel, having visited dozens of countries, never fully quenching her thirst to experience new cultures. A Celebration of Life was held April 5, 2019, at Bayfront Park, Anna Maria Island. The family requests that, in lieu of flowers, donations be made to The Myositis Association in Rose’s memory, www.myositis.org The family would also like to thank Bunny Montgomery, for her many years of friendship and support to Rose and her family. This tree will be trimmed, not cut down. Tree gets reprieve The Bradenton Beach Community Redevelopment Agency (CRA) recently decided to treat and trim, rather than remove, this large Australian pine tree in the city right of way at the corner of Highland Avenue and First Street North. Based on input from an arborist, the CRA members agreed to spend $736 to treat the tree with fungicide and $1,260 to trim the tree and remove the branches that hang above the privately-owned residential structure below. The property owner requested the tree be removed due to concerns about falling branches. “We can save the tree and get it trimmed down and alleviate the resident’s concerns for about $2,000,” Public Works Director Tom Woodard told the CRA members. 4/1, DUI, Gulf Drive and Archer Way. The deputy stopped the driver for various traffic violations. He developed probable cause and placed the driver under arrest. 3/30, warrant arrest, possession of drug paraphernalia, Bayfront Park, 111 S. Bay Blvd. The deputy saw a vehicle parked in the lot after hours and made contact with two people inside. One had a warrant out of Hillsborough County for his arrest and the deputy found drug paraphernalia on him, He was arrested. 3/25, theft, 200 Bridge Street. The victims, who were homeless, got an offer from a boat owner south of the Bridge Street Pier to stay on his boat. They got their belongings and left them while they got more but when they returned, everything was gone. 3/26, warrant arrest, mooring area south of the Bridge Street Pier. While inspecting the boats moored there, police found a boat owner had a warrant and he was arrested; 3/30, domestic violence, 1000 block of Gulf Drive South. An argument over who should clean a bait bucket turned violent. 4/1, theft, 2300 block of Gulf Drive North. A bike was stolen and another bike was left in its place. signs of impairment. The driver agreed to a field sobriety test and the offifcer arrested him as a result. 3/28, carrying a concealed weapon without a permit, possession of marijuana, 3200 East Bay Drive. The officer conducted a traffic stop and smelled marijuana coming from the car’s interior. While searching the interior, he found a Smith and Wesson .40-caliber handgun with an empty extended capacity magazine in it. All of the car’s occupants were separated by backup officers. The occupant seated in the passengers’ seat said the weapon was his. He said somebody tried to rob him so he got the gun. The officer also found bags of marijuana in the interior and the car’s trunk. The gun’s owner was taken to jail. LO C A L LY K N OW N . G LO B A L LY C O N N E C T E D.
member Jim Conoly. Short is a member of the charter review committee that recently completed its review of the city charter. During a recent city commission meeting, Mayor Dan Murphy thanked Conoly for his multiple-terms of service to the city. Church, 512 Pine Ave., Anna Maria, noon. Farmer’s Market, City Pier Park, 100 N. Bay Blvd., Anna Maria, 8:30 a.m.-2 p.m.
Library, 5701 Marina Drive, Holmes Beach, 11:30 a.m. Tech help, Island Branch Library, 5701 Marina Drive, Holmes Beach, 2 p.m.
Bradenton Beach, 10 a.m. to 4 p.m. Cheese making, The Folk School at Florida Maritime Museum, 4415 119th St. W., Cortez, 10 a.m., $38. Ukulele lessons, Island Branch Library, 5701 Marina Drive, Holmes Beach, 3 p.m. Call The Best in Buying and Selling Anna Maria Island! The #1 Team in Manatee & Sarasota County! Want it Sold! Call Us! Over 84 Million in Sales for 2018! Incredible Oceanfront Property sitting on Two Direct Gulf front Lots! Sweeping Beach and Ocean Views! Fabulous 3BD/2.5BA Island Home with 50 ft Pool, Custom Kitchen, Private Elevator, Multi-Car Garages, and Much More! All Concrete Built 4BD/3BA Waterfront Pool Home on LBK Privacy, Fine Details, Deep Water Canal, Intercoastal Views! Key West style 3BD/2BA Home with attached 2/1 Guest Suite Prime location!, Room for Pool, Willow Ave Beach Access! New Construction, 4BD/4.5BA Pool Home, Gulf & Bay Views! Rooftop Deck, Fireplace, Pool Guest House, Prime Location! Direct Bayfront in The Historic Cortez Fishing Village Almost ½ Acre, Zoning Options, 3BD/1BA Home, Great Boathouse! Coastal Beauty in Anna Maria, 5BD/3.5BA Pool Home Recntly Updated, Great Rental, Elevator, Ocean Views! Immaculate Waterfront Property, 4BD/4.5BA Pool Home, Excellent Location ,Elevator, Ultimate Coastal Living! Large 4BD/4.5BA Pool Home, Prime Location, New Construction, Private Pool Guest Suite, Great Rental, Close to Everything! came out fighting, scoring a touchdown in three plays, including a 10-yard gain by Parsons and the scoring reception by Burnett. Failing to convert, Progressive got the ball back with the score tied at 20 all. First play of the half for Progressive Cabinetry was to B. Sato who ran the football down the full length of the field after a short catch. Gardner’s pass to L. Sato was too tall going off her fingers, leaving the score at 26-20. Keeping the game close, catches by Stephens and B. Roberts, including a first down reception Stephens, and a run by Burnett put Lancaster Design in scoring position. C. Roberts pulled the football in for a touchdown and followed up with the extra point nab giving his team the lead once again by one point. With 12 minutes left on the game clock, Purvis found B. Sato for what looked to be a repeat of his early score. Parsons made the stop at the one-yard line. L. Sato sealed the deal with a solid TD catch. Going for two points, Purvis took the snap and hit Haughey pushing the score to 34-27. Lancaster Design could not make anything happen on their next possession, only to give Progressive Cabinetry another chance to score. In six solid plays, Purvis and Gardner marched the team down the field chipping away at the yardage. Defensively, Chris Culhane put the pressure on Gardner, sacking him in the Progressive backfield. A 10-yard gain by L. Sato, a first down catch by Haughey, and a long run by Gardner got Progressive to the Lancaster Design six-yard line. Gardner threw to L. Sato at the oneyard line. On third down, Haughey scored the TD and followed up with the point after to give his team a 14-point lead. The Progressive Cabinetry offense ate away at the clock leaving only one minute for Lancaster Design to score and hope to get the ball back before time ran out. Unable to make anything happen on offense, Lancaster Design lost the championship game to Progressive Cabinetry who called the game with 44.9 seconds left on the scoreboard, successfully ending another adult flag football season on the island, with the final score of 41-27. Shown here with the new cannon launch, Brandon Johnson, Greg LaPensee, Bryan Meador and Jason Ghromley won this year’s AMI Rotary Club Charity Golf Tournament. our best to support them,” LaPensee said. When asked about the win, Greg LaPensee said, “This is the second time we won – we won two years ago. This is a fantastic tournament. We support it as a company and the opportunity to give back to the Island is really important to me, especially having grown up on the Island.” The foursome of Bruce Abramson, Mark Caputo, Lee Anderson and Fred Carvin finished second with a combined score of 57.
from Indianapolis, was this year’s youngest contestant. Each foursome paid a $400 entry fee. The fundraising activities that continued during the awards dinner in the IMG banquet room included a silent auction and raffles that included Wheel Barrow of Cheer won by Paulie Caputo. Once again, nobody won the free car Bob Boast Volkswagen offered to the first golfer to score a hole in one on the designated par 3 hole. New this year was the addition of the airpowered cannon launch players used to tee off on the sixth hole. “I shot it and the ball went over 400 yards. I got within 15 feet of the green when I tested it,” Rotary Club President Dennis Schuermann said. On Monday, Schuermann said final numbers weren’t all in yet but this year’s tournament raised more than $12,000. The tournament proceeds will again support Rotary Club programs at the Anna Maria Elementary School, the AMI Rotary’s Learn to Swim Program and the $500 education grants given to the winners of annual Anna Maria Island Concert Chorus and Orchestra Young Solo Artist Competition. “We’ve got about 20 programs we help every year,” Schuermann said. and more dressy clothes will be on display. Fleece said to expect lots of bold prints, florals and stripes. “I want everyone to know that there’s fashion out there to feel good about yourself in, no matter what your size, your age or anything,” she said. Each attendee will receive a swag bag full of goodies at the end of the show. All proceeds go to help fund The Center's programs. Answers to 04-03-19 Crossword Puzzle. ANNOUNCEMENTS FACE PAINTER/PORTRAIT ARTIST Island student artist, reasonable price for parties, events, and special portraits. Call/text Lillian 210-380-9691 THE BEST VOLUNTEER position on the island. The AMI Historical Museum needs docents and bread makers. Call Lynn at 813758-3234 or lbrennan47@ gmail.com ROSER FOOD BANK needs donations of cash and non-perishable food. Donations boxes are located at the Church, Moose Club, and Walgreen’s. VARIDESK CUBE CORNER 36, two tier design and keyboard deck. Heavyweight base for stability. Color black. Also Varidesk sitting/ standing chair and floor mat. All perfect condition. All pieces new $805. Asking $250. Call Steve 941-724-2728. JSAN CORPORATION Renovations and Handyman Services 941-2430995 jsancorporation@gmail. com Flooring, Drywall, Painting, Repairs, Kitchen and Bathrooms, Trim & Doors. Credit Cards Accepted. LOST DIAMOND STONE on Trolley or shops on Anna Maria Island. $500 REWARD. Call 314-324-5921 LOST WHITE GOLD 18 carat wedding band on Anna Maria Island on beach near Sandbar Restaurant. Call 352-484-4040 if found. MOVING & STORAGE MARTIN’S MOVING YOUR Island movers! Offering dependable, competitive rates. No hidden costs. 941-809-5777.